Liverpool were a "joy to watch" as they thumped West Ham United 4-1 to move above Manchester United into second place in the Premier League, said manager Jurgen Klopp. Forwards Mohamed Salah, Roberto Firmino and Sadio Mane all scored in the second half in a resounding Anfield win for the Reds. Klopp told BBC Sport: "You hope for a game like this, and you want to see it, but it's really rare that you get it. "Today we got it and it's unbelievably important for us because of the situation in the table and the period of the season we are in." Emre Can headed Liverpool ahead from a corner - the Reds' 100th goal this season - after Salah had been denied by a post. Salah made it 2-0 with an instinctive, low finish after a delicious pass by Alex Oxlade-Chamberlain, before Firmino added the third after a mistake by goalkeeper Adrian. Substitute Michail Antonio's quality, low finish gave West Ham hope - but Mane, who had hit the post moments before, completed a fine Liverpool win. "The quality of the players Liverpool have got at the moment caused us big problems," said Hammers boss David Moyes. On the eve of the Carabao Cup final, Klopp is still chasing his first major trophy since taking charge of Liverpool in October 2015. But at least the league table makes healthy reading for the German, whose side have one foot in the quarter-finals of the Champions League after a 5-0 thrashing of Porto. On 22 October, Klopp's side were battling to stay in the top half after a 4-1 defeat against Tottenham at Wembley left them ninth behind teams such as Burnley, Watford and Newcastle. Four months on, Liverpool lead the 'best of the rest', one point ahead of third-placed United and 15 behind runaway leaders Manchester City. With 10 matches remaining, Liverpool are on course for their highest league finish since 2013-14, and their trip to Old Trafford on 10 March will go a long way to deciding whether they can take second spot. "Can we stay second? That depends on the other results," added Klopp. "We have to focus on ourselves. The next game is Newcastle and Rafa Benitez is one of the best managers in the world." Liverpool's clinical finishing and counter-attacks again proved the difference, though not until Firmino made it 3-0 were the hosts able to really relax. When they did, they conceded, but even Antonio's goal could not take the shine off this win. Liverpool are now unbeaten in 16 matches at home in the league - hitting excellent form at the right time of the season. "We defended well and attacked well," said Klopp. "Our counter-attacking was outstanding, the work-rate was outstanding and the attitude was fantastic." 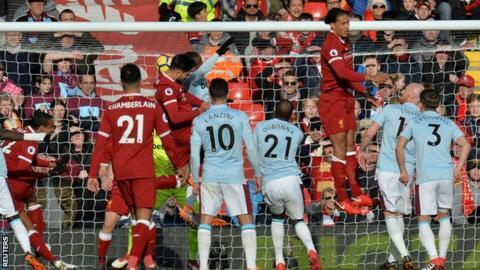 With the game goalless, Marko Arnautovic produced an outrageous lob which was tipped onto the bar by Loris Karius, and the Liverpool keeper was later tested from outside the area by the Austrian. Yet positives were few and far between for Hammers boss Moyes, who gave a debut to former Manchester United full-back Patrice Evra. His side are down to 13th in the table, their safety cushion cut from four points to three with 10 matches remaining. Fifteen years on from his first visit to the venue as a manager, Moyes has yet to win at Anfield. This was his 15th game at Liverpool's home - and his eighth defeat. Yet the Scot was keen to focus on the positives after seeing his team ripped apart by Liverpool's front three. "We knew how hard it was going to be but I thought we played well in the first half," said Moyes. "We were never going to get loads of chances here, we knew that." Time will tell whether this heavy defeat was a blip or something more troubling. West Ham came within seven minutes of a draw at Manchester City on 3 December, while they have beaten Chelsea and drawn with Tottenham and Arsenal since Moyes took charge in November. But this was a day to forget. There were candidates all over the pitch. Alex Oxlade-Chamberlain was involved in some of Liverpool's best moves while James Milner was solid as captain. Trent Alexander-Arnold impressed at full-back too. But Mohamed Salah was again excellent and enters the business end of the season in unstoppable goalscoring form. Liverpool have scored four or more goals in three consecutive league games against a single opponent for the first time since doing so against Norwich between 2012-2013. Moyes has failed to win at Anfield as manager of Everton, Manchester United, Sunderland and now West Ham. Salah has been directly involved in 31 Premier League goals this season (23 goals, eight assists), more than any other player. He has scored 20 goals with his left foot in the Premier League this season, the most by a player in a single season in the competition's history. Liverpool (103) are the second Premier League team to score 100-plus goals in all competitions this season after Manchester City (111). Evra made his Premier League debut for West Ham, the 36-year-old Frenchman is the fifth-oldest outfield player to make an appearance this season. Antonio has scored in four of his five appearances against Liverpool for West Ham. Liverpool await former boss Rafael Benitez's return to Anfield with Newcastle United next Saturday (17:30 GMT). On the same day, West Ham are involved in a game which could have a huge impact in the battle to stay up when they face Swansea in south Wales (15:00). Match ends, Liverpool 4, West Ham United 1. Second Half ends, Liverpool 4, West Ham United 1. Offside, Liverpool. Dominic Solanke tries a through ball, but Andrew Robertson is caught offside. Attempt saved. Alex Oxlade-Chamberlain (Liverpool) right footed shot from outside the box is saved in the centre of the goal. Assisted by Trent Alexander-Arnold. Corner, Liverpool. Conceded by James Collins. Substitution, Liverpool. Dominic Solanke replaces Mohamed Salah. Attempt missed. Adam Lallana (Liverpool) right footed shot from the right side of the box is too high. Assisted by Mohamed Salah. Substitution, West Ham United. Declan Rice replaces João Mário. Attempt missed. Sadio Mané (Liverpool) left footed shot from outside the box is close, but misses to the right. Assisted by Andrew Robertson. Goal! Liverpool 4, West Ham United 1. Sadio Mané (Liverpool) right footed shot from very close range to the bottom left corner. Assisted by Andrew Robertson. Sadio Mané (Liverpool) hits the left post with a left footed shot from the centre of the box. Assisted by Alex Oxlade-Chamberlain with a through ball. Attempt saved. Alex Oxlade-Chamberlain (Liverpool) right footed shot from outside the box is saved in the centre of the goal. Assisted by Emre Can. Attempt missed. James Collins (West Ham United) header from the right side of the box is just a bit too high. Assisted by Aaron Cresswell following a set piece situation. Patrice Evra (West Ham United) wins a free kick in the attacking half. Attempt saved. Sadio Mané (Liverpool) right footed shot from outside the box is saved in the top centre of the goal. Assisted by Alex Oxlade-Chamberlain. Attempt saved. Roberto Firmino (Liverpool) left footed shot from the centre of the box is saved in the centre of the goal. Assisted by Sadio Mané with a through ball. Goal! Liverpool 3, West Ham United 1. Michail Antonio (West Ham United) right footed shot from the right side of the box to the bottom left corner. Assisted by Cheikhou Kouyaté with a through ball following a fast break. Goal! Liverpool 3, West Ham United 0. Roberto Firmino (Liverpool) right footed shot from the centre of the box to the bottom right corner. Assisted by Emre Can with a through ball. Attempt saved. Sadio Mané (Liverpool) right footed shot from the centre of the box is saved in the centre of the goal. Assisted by Roberto Firmino with a through ball. Attempt missed. Alex Oxlade-Chamberlain (Liverpool) right footed shot from the right side of the box is close, but misses to the right. Assisted by Trent Alexander-Arnold. Corner, West Ham United. Conceded by Joel Matip. Pablo Zabaleta (West Ham United) wins a free kick in the attacking half. Goal! Liverpool 2, West Ham United 0. Mohamed Salah (Liverpool) left footed shot from the centre of the box to the bottom right corner. Assisted by Alex Oxlade-Chamberlain.